"We see MarketSquare as both a benefit to our advisor clients and to the vendors who want to increase awareness of their products and services." SAN FRANCISCO--(BUSINESS WIRE)--Schwab Intelligent Technologies announces the launch of Schwab OpenView MarketSquare™, a review site that compiles feedback and ratings from independent registered investment advisors (RIAs) on some of the leading technology vendors and products in the industry. Since announcing the MarketSquare concept in November 2012, Schwab Intelligent Technologies has received more than 400 reviews from advisors on more than 80 different products. For today’s launch, the site includes reviews on 15 technology products in the areas of CRM, portfolio management, document management, trading and rebalancing, and financial planning. MarketSquare is available for advisors who work with Schwab Advisor Services™ through www.schwabintelligenttechnologies.com. Advisors can read the current reviews, submit reviews for technology products they are using, read comments or feedback provided by the vendors themselves, and access vendors’ contact information on the website. 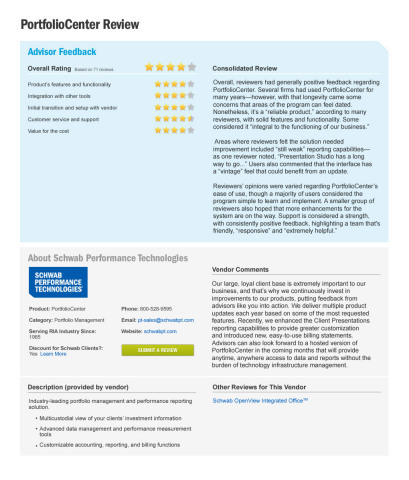 MarketSquare reviews consist of a combination of both quantitative and qualitative feedback. Advisors rate a product on a five-point scale across several categories, including feature and functionality, setup and implementation experience, and customer service and support. They can also include lengthy written comments. The reviews are then categorized and analyzed so that prevailing sentiments are identified, and a consolidated review is produced. Common themes are highlighted from advisor comments – both positive and negative – that include verbatim quotes that help amplify the voice of advisors. Only products with a minimum of five reviews are candidates for inclusion. More than 40 leading companies have currently agreed to have their products and services reviewed on MarketSquare. Among those companies that will have product reviews on MarketSquare at launch are Envestnet|Tamarac™, Salentica® CRM, Junxure®, Morningstar®, and Schwab Performance Technologies®. All vendors reviewed on MarketSquare have given permission for their products to be featured, though they do not edit or revise the review. They do have the option to provide a response. Vendors that are interested in becoming part of MarketSquare are encouraged to contact providers@schwabintelligenttechnologies.com. The Charles Schwab Corporation (NYSE: SCHW) is a leading provider of financial services, with more than 300 offices and 8.9 million active brokerage accounts, 1.6 million corporate retirement plan participants, 888,000 banking accounts, and $2.08 trillion in client assets as of March 31, 2013. Through its operating subsidiaries, the company provides a full range of securities brokerage, banking, money management and financial advisory services to individual investors and independent investment advisors. Its broker-dealer subsidiary, Charles Schwab & Co., Inc. (member SIPC, www.sipc.org), and affiliates offer a complete range of investment services and products including an extensive selection of mutual funds; financial planning and investment advice; retirement plan and equity compensation plan services; compliance and trade monitoring solutions; referrals to independent fee-based investment advisors; and custodial, operational and trading support for independent, fee-based investment advisors through Schwab Advisor Services. Its banking subsidiary, Charles Schwab Bank (member FDIC and an Equal Housing Lender), provides banking and lending services and products. More information is available at www.schwab.com and www.aboutschwab.com. Schwab Intelligent Technologies (“SIT”), Charles Schwab & Co., Inc. and Schwab Performance Technologies (“SPT”) are affiliated as separate subsidiaries of The Charles Schwab Corporation, but their respective products and services are independent of each other. Charles Schwab & Co., Inc. provides brokerage services, while SPT licenses software and provides related technology products and services. PortfolioCenter® is a product of SPT. 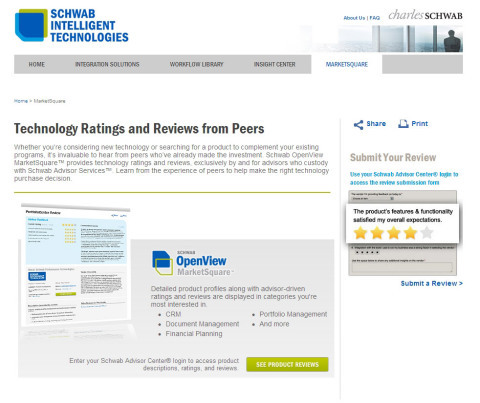 Schwab OpenView MarketSquare™ is a product of SIT. Third party firms and speakers are not affiliated with or employed by Charles Schwab & Co. Inc.